We share some interesting facts about cats and how you can help your cats healthy and happy with Ceva Cat products. This is Stripes! She belongs to my daughter Kristal, but has been living with us all her life. Just recently she went missing and we had no idea where she was. Turned out she was locked in my neighbors garage because she's like most cats, inquisitive. She follows you around because she thinks she's a dog and is one of the friendliest cat you'll ever meet, and just like a dog, she sheds and leaves her hair everywhere. However, we also have another cat, Kitty whom you've met in the past. Kitty is the Queen of the House and despises Stripes, because Stripes has now taken over her domain, but we do have love enough for both of them. 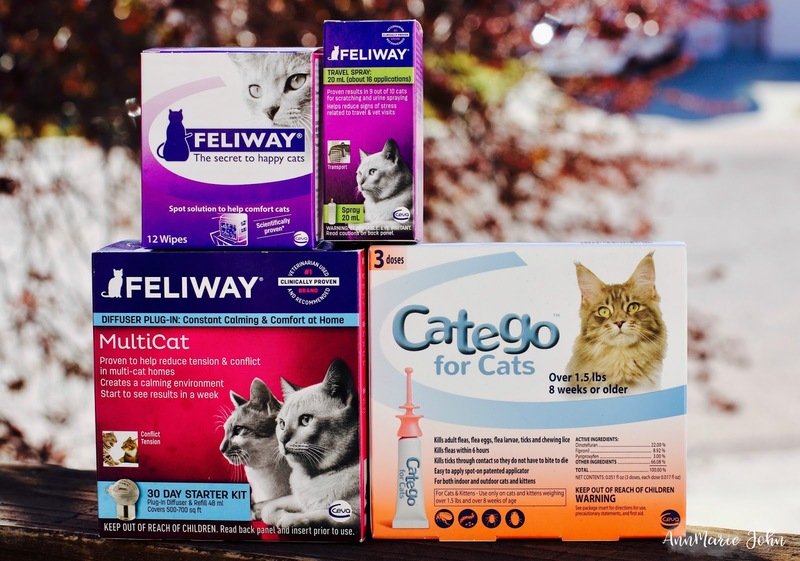 I recently received a Ceva Cat BabbleBoxx filled with some amazing products from Catego™ and Feliway®, and also a few items just for me, that I want to share with you today. Before I dig into what my cats got, lets take a look at what I received. Don't you just LOVE that Catego cat coffee mug? Not only do I love my coffee but I love my cats, so this is just perfect for me. 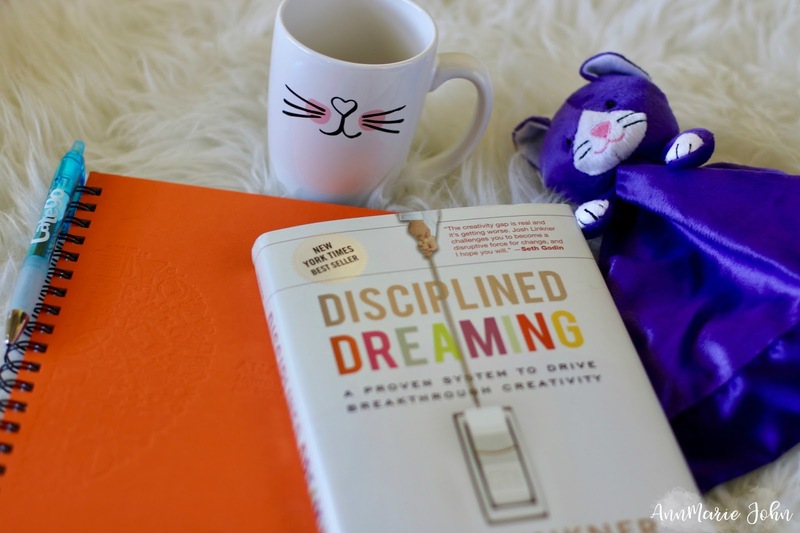 We also received a Catego journal complete with a Catego pen, the book Disciplined Dreaming: A Proven System to Drive Breakthrough Creativity by Josh Linkner and a snuggly Feliway toy, that Madison has claimed for her own. Now let's dive into what Kitty and Stripes received. Now while my cats don't have fleas, you can never be too safe. They both love the outdoors and that's where they can pick it up. 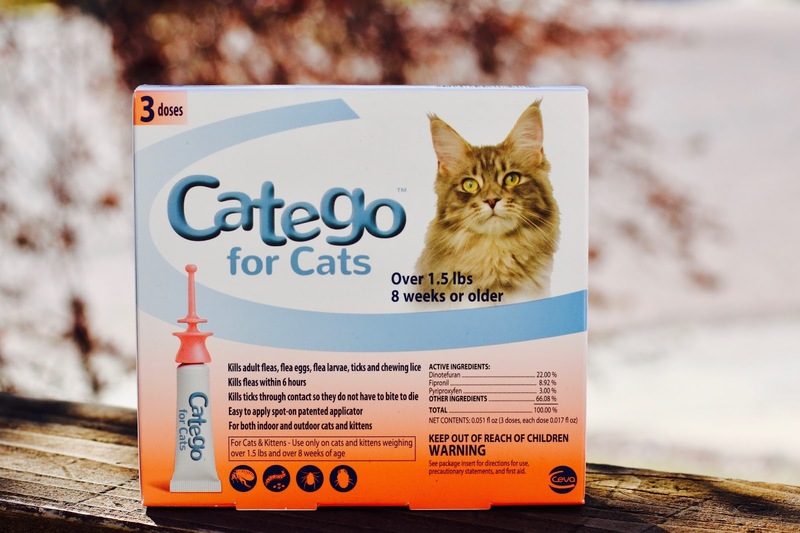 Catego™ is powerful flea and tick control designed specifically for cats and cats alone! Its a topical flea and tick preventive that is easy to apply thanks to its tube and patented applicator. It has one low-volume formulation for all cats weighing over 1.5 lbs and over 8 weeks of age and kills fleas within 6hrs and protection lasts an entire months. It also kills all life stages of ticks through contact, including the Brown Dog Ticks, American Dog Ticks, One Start Ticks and Deer Ticks. Catego™ is currently available through Amazon and veterinarians, and will soon be available for purchase at PetSmart. Now this product I just have to tell you about, especially if you're a multi-cat household, and your cats don't get along like mine do. 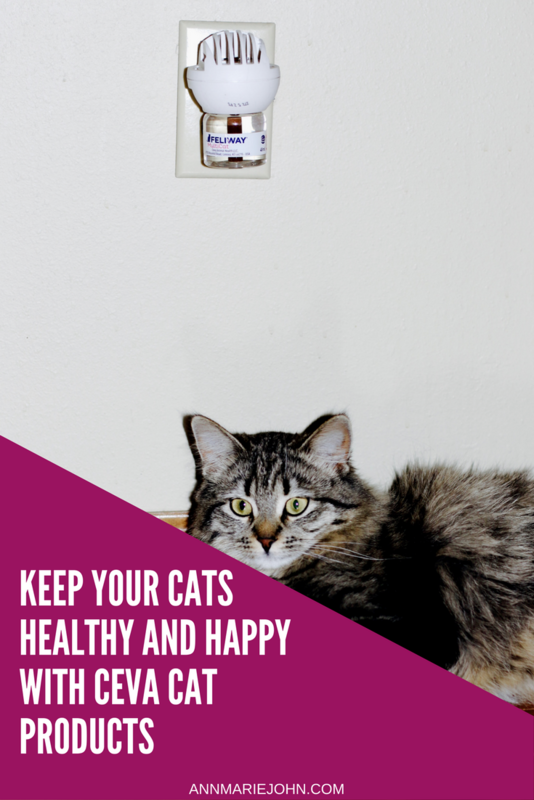 The Feliway® Multicat Diffuser is a copy of the natural pheromone that helps cats bond with each other. You simply plug it into the room where your cats spend the most time and voila! Our cats spend most of their time outside the bathroom door just lounging around and I plugged it in there. Stripes I've noticed has been constantly laying below it and you can find her there almost all day. However, I've noticed a difference in Kitty's behavior, she tolerates Stripes a lot more and the hissing has even stopped. Yay! Now if only she would tolerate the kids. 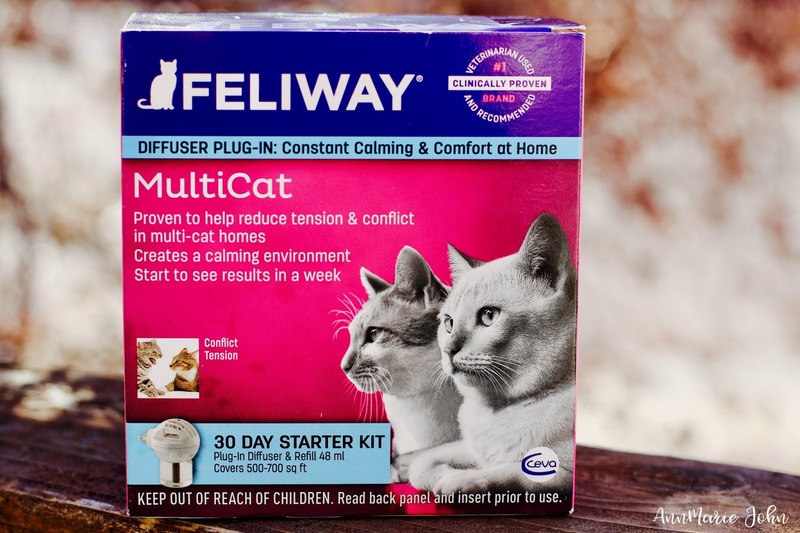 You can purchase your own Feliway® MultiCat Diffuser through your veterinarian. 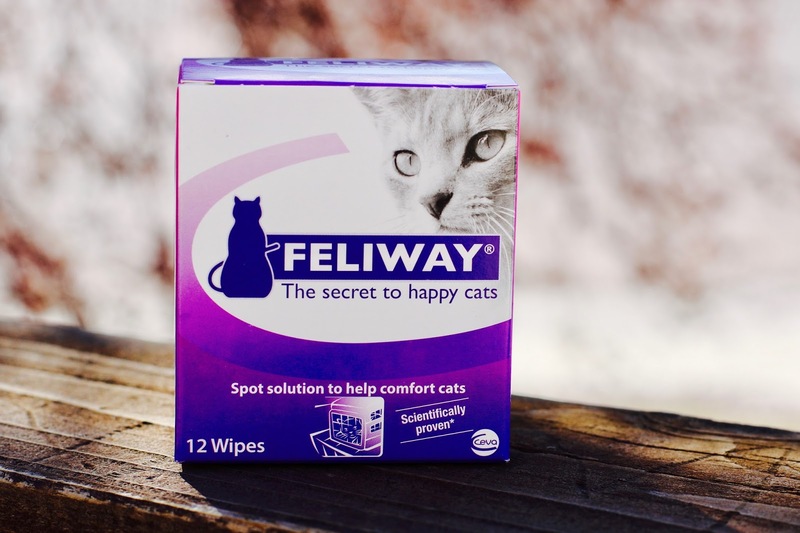 To find a Feliway® vet near you visit Feliway.com/us/buy. If you plan on traveling with your cats these are a great way to get your cats to feel safe and comfortable in their environment. Stress can cause behavioral problems in cats such as urine spraying, scratching and hiding. The pheromone in the wipes is the same in the diffuser and can help calm your cat during his/her travels. Simply wipe them along the surface of his crate and reapply every 4-5hours. When your cat feels comfortable in his/her environment, you may notice that they rub their cheeks again the objets, leaving a message know as a facial pheromone. You may notice that your cats may do that against your furniture and even against you. This "happy marker" provides confidence to your cat. 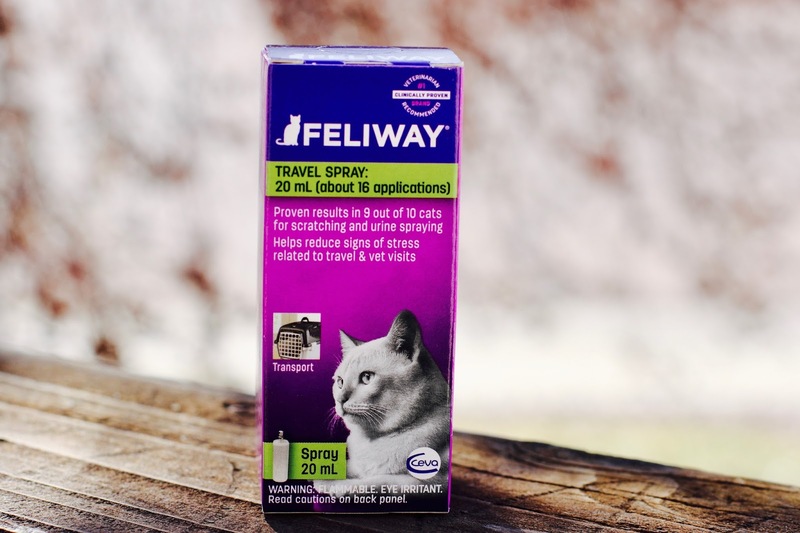 The Feliway® Travel Spray contains a synthetic replica of that pheromone and is clinically proven to reduce stress in kittens and adult cats that leads to inappropriate behaviors. This is NOT a sedative or tranquilizer. When traveling simply spray 8-10 pumps directly into the carrier 15 minutes prior to introducing your cat. Reapply every 4-5 hours as needed. This is a great way to take your cat to the vet. 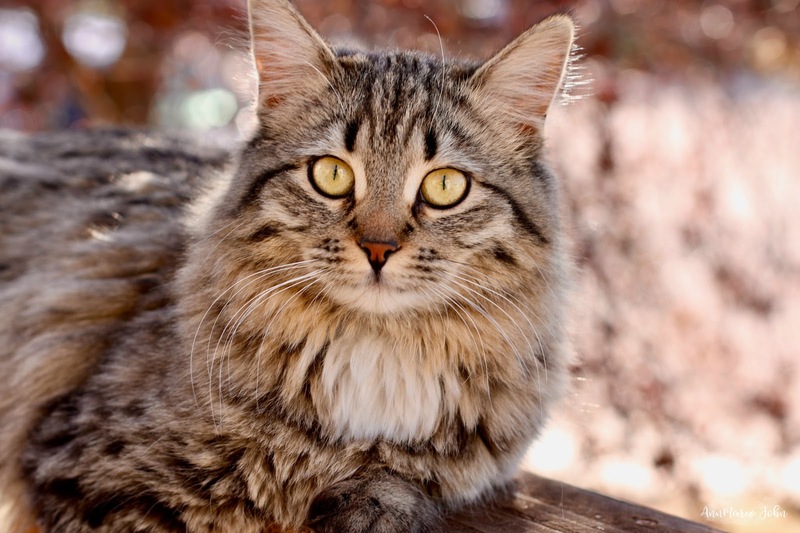 Now that you've learned how Catego™ and Feliway® can keep your cats healthy and happy , here are 20 interesting facts about cats that you may not have known. 1. Most cats are lactose intolerant and should not be given cow’s milk. 2. When cats knead their paws it’s because they are happy. 4. An adult cat has 30 teeth. 5. Cats can run up to 30 miles per hour. 6. A cat can jump seven times its height. 7. Cats don’t have a sweet tooth; they cannot taste anything that’s sweet. 8. Cats have a sense of smell 14 times stronger than a human. 9. Cats greet one another by touching noses. 10. A group of kittens is called a kindle while a group of cats is called a clowder. 11. Cats sweat through their paws only. 12. Cats spend an average of 2/3 of every day sleeping. 13. A cat can’t climb head first down a tree due to their paws pointing the same way. 14. There are more than 500 million domestic cats in the world. 15. Cats were associated with witchcraft in the Middle Ages. 16. Approximately 40,000 people a year, in the United States, are bitten by cats. 17. When a family cat died in Egypt, the family would mourn the cat by shaving off their eyebrows. 18. Cats usually give birth to a litter of no more than 9 kittens. 19. The largest wild cat today is the Siberian Tiger, weighing 700lbs and on average 12’ long. 20. In Britain & Australia black cats are considered lucky. There you have it, some 20 interesting facts about cats to enlighten you today; since cats are a large part of history you will find a lot of cat facts in regard to the Egyptian culture. It’s pretty interesting to learn more about cats, isn’t it? And talk to your veterinarian about Ceva Cat products today! I have everything in this box! We are so happy with all the Catego gear. And Feliway is already working! Juniper loves her purple stuffie. We don't have any cats around the house anymore. For all those people who do and love their cats all these sound like great products to keep kitty healthy and happy. I don't have cats - I have dogs - but these sound like great products to keep your kitties healthy! If they are like our dogs, they are family members! I am so happy to see when people take good care of their pets. We are so responsible for their little lives! Those are some cool facts! I didn't know about a lot of these. I love your cute cat mug and that book sounds really interesting. I'm going to have to check out the feliway. My cat HATES getting into it's carrier when going to the vet. I really enjoyed the 20 facts they were definitely interesting and all things I didn't know! THat looks like great advice and products for the cat owners. We are a dog family but my husband has tried for years to convince me to get a cat. Such a cute cat. We think of our pets as members of our family- definitely need to keep them healthy. I didn't know all of those facts about cats! Those are some awesome facts. I didn't know all of those. We have a black cat and she is the sweetest thing! I am sadly allergic to cats, but I love the diffuser! Sharing with my cat loving friends. Wow, those are some really interesting facts! I've had cats all my life and didn't know a lot of those! Okay, first of all I had no idea that cats could jump that high. Catego and Feliway sound like products that would be great for cats. Thanks for the tip. My parent's cats love milk. Even growing up those cats love it too. They would finish the end of the cereal bowls. I have a bad allergy to cats. But we have a couple in our barn that love to help with the mice, I will have to look into this! I would love love a kitty, but my whole family is allergic! Maybe one day I can be a little old lady with a cat! I think they are all great products for cats. Thanks for sharing. Your cat is beautiful! We have two cats and these products would be great for them. This is such a sweet post! I don't have a kitty cat but if I ever get one I will adopt your advice! Such sweet ideas! Thank you! Your cat is so cute. I don't own a cat but i'll pass this info to my sister in law. I have two cats and they are bonded siblings. They are the sweetest things ever! This box may be fun for them!